World Water Day, March 22, is an annual celebration of one of humanity’s most precious resources—the chemical compound dihydrogen oxide, more commonly known as water, or, “H2O,” the medium of life on the Blue Planet. Twenty-two years ago, the United Nations General Assembly instituted this annual celebration, and each has a particular theme. This year’s theme, “Water and Sustainable Development,” shines a light on the critical role water will play in our future, from life-giving drinking water to agricultural and manufacturing process water and so much more. 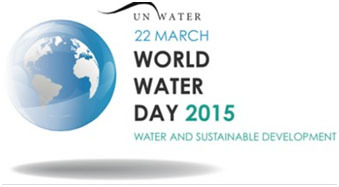 The 2015 World Water Day focus on sustainable development reflects the current global undertaking to establish a new set of sustainable development goals (“SDGs”) upon the foundation of the 2000-2015 UN Millennium Development Goals. The new SDGs will contribute significantly to the post-2015 UN development agenda, which will be launched in September, 2015, when the Millennium Development Goals are due to expire. According to the World Bank website, “People concerned about sustainable development suggest that meeting the needs of the future depends on how well we balance social, economic, and environmental objectives–or needs–when making decisions today.” The International Institute for Sustainable Development notes that all definitions of sustainable development require that we see the world as a system that connects both space and time. 1The World Commission on Environment and Development’s (the Brundtland Commission) report Our Common Future (Oxford: Oxford University Press, 1987). Goal #1, and the prime focus of the SDG effort, is to “End poverty in all its forms everywhere.” This sweeping, ambitious goal is unachievable without access to safe drinking water and adequate sanitation. Goal #3, “Ensure healthy lives and promote well-being for all at all ages,” depends, at the most basic level, on consuming healthful water and living in an environment in which pathogen-laden waste is removed from human contact. use, enabling women and girls to focus on careers and education without the distraction of having to fulfill the traditional role of procuring household water by traveling on foot to a water source. Goal #8, “Promote sustained, inclusive and sustainable economic growth, full and productive employment and decent work for all,” is only possible if safe water and sanitation needs are not a constant concern that consumes time, energy, and the health and resources of people at all stages of life. This World Water Day, raise a glass of dihydrogen oxide and toast its “front and center” role in global sustainable development! 1 Held at the United Nations headquarters in New York between March, 2013 and July, 2014.